Students need to put in order the words to make correct sentences. 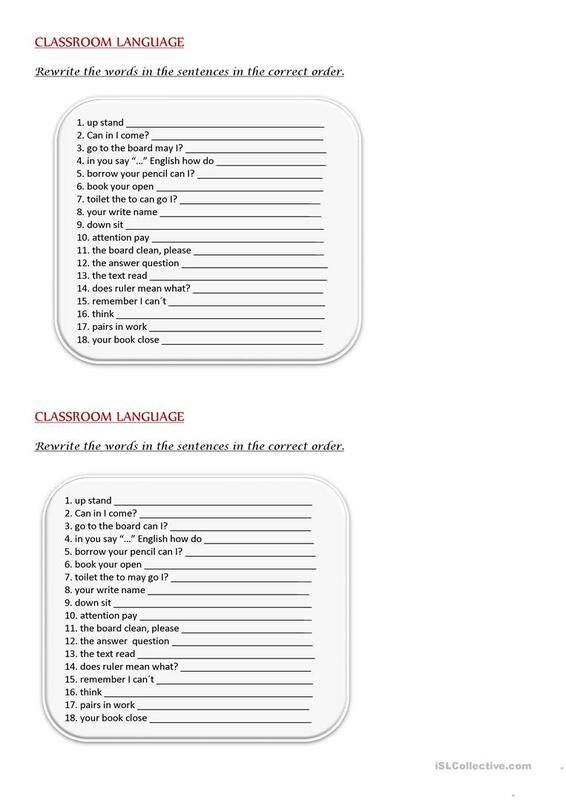 The vocabulary revised is about classroom language which can be used the first day of class to remind students of all the phrases, imperative sentences that they can use. This downloadable printable is recommended for elementary school students at Elementary (A1) level. It is great for practising Word order in English, and was designed for improving your learners' Speaking skills. It focuses on the theme of Classroom. mar24 is from/lives in Argentina and has been a member of iSLCollective since 2013-03-18 02:16:41. mar24 last logged in on 2019-04-20 21:20:35, and has shared 14 resources on iSLCollective so far.